FDC president Gen Mugisha Muntu campaigns for FDC’s Mariam Naigaga recently. Photo by Raymond Mayanja. President Museveni and Dr Kizza Besigye the former Forum for Democratic Change (FDC) presidential candidate are to face-off this week in the Iganga district Woman MP by-election. Museveni, who is the chairman of the NRM, is expected in the area today, to solicit votes for the party’s candidate Brenda Asinde ahead of Thursday’s polls. President Museveni’s longtime rival and former bush war comrade, Dr Besigye is also preparing to arrive in the constituency tomorrow to campaign for FDC candidate Mariam Naigaga. The seat fell vacant following the death of Hailat Kaudha who succumbed to pregnancy-related complications in May this year. Both the State House and FDC head offices confirmed that Museveni and Besigye will be in Iganga district. Speaking to KFM, a local radio station this morning, Don Wanyama, the Senior Presidential Press Secretary, said Museveni has interrupted his radio land sensitisation programmes to go to Iganga and campaign for the NRM flagbearer. Walid Mulindwa, the FDC national youth leader, said the entire top leadership of FDC will move with Besigye to traverse Iganga district. “All groups vying for FDC presidency have been in Busoga. But now we are going to combine our forces to grab this seat from NRM party and this is why Dr Besigye is going there tomorrow,” Mulindwa explained. Last week, FDC president Maj. Gen. (rtd) Mugisha Muntu and several party MPs were in the district to rally support for Naigaga. Two weeks ago, one of the candidates in the race for the FDC presidency, Partick Amuriat Oboi and his team were also in the district. Five candidates are tussling it out to represent Iganga district. Others in the race are Mariam Nakato, Aziza Kakerewe and Olivia Kwagala Mawanda, all independents. NRM’s Brenda Asinde and her supporters head for a rally recently. Courtesy photo. It’s too early to predict the winner but the political battle is between Asinde and Naigaga. Throughout the campaign, the supporters of both camps have been engaging in violence. NRM has won almost all the by-elections organised by Electoral Commission across the country since last year’s general elections. It was only defeated by independent candidates in Kyadondo East and and Aruu. Water issue is a defining factor in this by-election. Asinde gained fame because of her availing water to rural areas in Iganga district, a feat that made people to start referring to her as Mama Maadi, translated to mean Mother of Water. Some of her supporters believe their candidate won last year’s general election and was rigged out by a section of NRM leaders in the district. On the campaign trail last week, Asinde who has been campaigning while pregnant, gave birth to a baby boy last Tuesday. FDC on the other hand is riding on the land issue, accusing this NRM government of plotting to grab people’s land. Much as the party has faced a setback in previous by-elections, on this one, it is not sitting back. “And it has a political bearing on the FDC presidential race. If Naigaga belongs to Muntu camp, she will influence FDC members in Busoga to vote him. And if she supports Amuriat, she will work for him to defeat Muntu,” Mulindwa argued. Meanwhile, five people were injured yesterday in chaos that broke out in the district after FDC supporters allegedly attacked NRM supporters. The 8:30 p.m. incident happened after the NRM candidate had completed addressing a campaign rally at Nakigo trading centre. 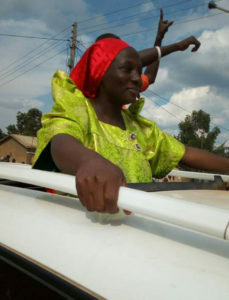 Witnesses say FDC supporters armed with stones waylaid Asinde and her supporters as they closed a late evening rally and pelted them with stones. The district police commander Iganga, Nassibu Nditta, said three people have been arrested in connection with the incident. He cautioned supporters of the rival candidates to desist from causing violence. According to the roadmap released by the Electoral Commission, campaigns will end tomorrow, September 12 and polling will take place on Thursday this week.